Kathleen Stewart. Ordinary Affects. Duke University Press, 2007. To name something as ordinary is not without risk. At once the founding act of all that is worthwhile in cultural studies, it also marks the source of all its troubles; the ambiguity of naming culture as ordinary is the stigmata of the burden that cultural studies (often unwittingly and unwillingly) carries. Inevitably bearing the freight of representing the fantasy of “average” life, mobilising the term ordinary is as likely to alienate as to garner assent. Thus an Amazon.com reviewer of Kathleen Stewart's Ordinary Affects can write: “I was disappointed. I was looking for a serious work on feeling and ordinary life. Instead what I found was a literary and post-modernist account of weirdness and banality in America. There are of course people who like that kind of thing.” This reviewer gave the book one star out of five. “Ordinary,” like the term cultural studies, seems to promise something it never intends to deliver; a promise of what it is constitutionally designed to renege upon. To seek out the ordinary might suggest a desire for unity and cohesion, while all that culture offers are singularities (ordinaries) organised around conflict and unevenness. When, in 1958, Raymond Williams demanded that “culture is ordinary,” he had in mind neither a sense of ordinary culture as representative of “the average Joe or Josephine,” nor of a commitment to a particular sphere of life (domestic life over public life, physical labour over intellectual work, for instance). For Williams, “ordinary” signalled a commitment to the messy, provisional and deeply corporeal “whole ways of life” of a community, a culture. And while we may argue about the entanglement of “community” and “culture” in Williams' formulation, his use of the word “whole” was never intended to signal consistency or coherency: the dedication was to life in its fractured, effervescent, unmanageable totality. “Ordinary” is the world pulsing with life in its very singularity, existing across and in the interstices of the arbitrary and unhelpful distinctions we can't help making between “labour” and “love,” “private” and “public,” “text” and “context,” “art” and “economics.” The term “ordinary” is a flag raised in commitment to a world in solution (and dissolution), a commitment to the heuristic, pre-specialised gestalt of life—an unachievable goal, no doubt, but one worth striving for nonetheless. Stewart's book conjures up a world of humdrum violence, banal perseverance, and unexpected tenderness. It is composed of a series of vignettes that neither lend themselves to structured argument, nor to discrete chapters (indeed the contents page reads simply: acknowledgements ix; Ordinary Affects 1; references 131). Its atmosphere is simultaneously small town gothic, blue-collar naturalism, and main street surrealism. The world that is painted is filled with correspondences and miscommunications, with mounting frustrations and outbreaks of intensity. Stewart is an anthropologist who studies the side of American life that is off the tourist map. Her book reads like a field diary of someone sensitized to a range of emotional ecologies as they are played out in the localised encounters of individuals, couples, and small groups. There is no overarching sense of America here, but also no feeling that you could be anywhere else. In a short introductory section (the closest thing that comes to a chapter in the book), she points to the theoretical work that is clearly threaded through the book as a buried seam. She takes her cues from Roland Barthes, Lauren Berlant, Gilles Deleuze, Alphonso Lingis, Michael Taussig, and Walter Benjamin. But once the name check is complete her practice is aphoristic, descriptive, and evocative. This is not a theoretical book in the sense of being a theoretical disquisition; rather it is implicitly theoretical in its inquisitive commitments and its descriptive style. In one of the endorsements on the back of Ordinary Affects, Lauren Berlant claims that this is “a profoundly pedagogic book.” Yet, there is nothing explicit here that can simply be extracted and applied to something else, no easily borrowed system of thought or analysis, no quotable paragraph that would underwrite a methodology. Stewart’s pedagogy is deep and performative. As you read the book you become more and more alert to your surroundings. Your skin begins to prickle with the apprehensions of the lives of others, of resonances of care and indifference, of anxiety and ease. It is the pedagogy that Walter Benjamin claims is characteristic of fairground rides, of the mechanism of cameras, and the jarring attempts of crossing busy roads. It attunes and re-attunes the human sensorium. I read the book on a train journey from the South West of England up to the North Western coast (just below the Lake District). Passing through a dozen towns and cities of the English Midlands I saw countless down-at-heal Victorian terraced streets, peppered with corner shops, austere pubs, and boarded-up petrol stations. For anyone spending any time in England this is a familiar sight. Yet by about Birmingham the streets began to change: their familiarity was unsettled and I was filled with feelings that new places generate when you first set out on your own. Arriving in an unfamiliar town as an apprentice adult, such streets were never “mean” or “impoverished,” but the corridors of anticipation, possibility, trepidation, and disappointment. I swooned with a strange admix of lonely-excitement that I hadn’t felt for a couple of decades. The damp stone and brick of a forlorn landscape began to bristle with the possibility of adventure, with the possibility of endless somethings. The thing-ness of something is Stewart’s insistent object. Her guide is the action of listening-in, of observing, of passing-by, and taking-part. She is in a cafe in Ohio watching and listening as an ill-matched couple strive to get through what looks like a first date. The man is tucking into a high cholesterol plate of “biscuits and gravy” while his companion eats a grapefruit and a cluster of vitamin supplements while outlining her extensive fitness regimes. Stewart's practice is descriptive and in a few paragraphs she evokes a meal of awkward exchanges, of embarrassment and disdain. Her final sentence assesses the situation without judging the participants: “And things were happening, all right, even though ‘it’ was so ‘not happening’” (31). The “thing” of experience here is the materiality of disappointment, of condescension received and given, of wishing away time, of suffering the ill-ease of not getting along. And in our turn, as “critical readers,” what do we do? Do we judge Stewart’s descriptions as adequate (or not), productive (or not), analytical (or not)? Such judgements seem to flounder in face of a much more pressing and immediate question. Do we recognise this scene? Do we know the hunched-over mumbling awkwardness of the meeting or not; do its affects resonate with us? Recognition and empathy are judgements more usually reserved for fiction than academic work, but here they are the only ones that really appear to matter. My shelves sometimes seem to moan with the weight of obligation: books requiring reading; books demanding political allegiances; books decrying all kinds of scholarly misadventures and naïveties; books wanting theoretical acquiescence. Clamouring for position they all seem to want something of me, something from me. Not that this, in itself, is bad, it’s just that such jockeying for position doesn’t necessarily make me want to linger too long in their company. Fortunately, though, my shelves are also spotted with other kinds of books; those that sit there quietly like lucky-finds, happy to bide their time, content to be forgotten or remembered or dreamt about. 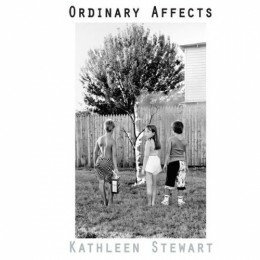 Kathleen Stewart’s Ordinary Affects has joined this smaller, less needy, group. It sits winking slyly across the room at books like Roland Barthes’ A Lover’s Discourse, or Robert Bresson’s Notes on the Cinematographer. I may not pick it up again for a week or a decade, but when I do I think I’ll always recognize it for what it is—a gift. Ben Highmore is a Reader in Media Studies at the University of Sussex. His research is broadly concerned with the culture of daily life and the history and theory of everyday experience. His current book projects include The Great Indoors: An Intimate History of the British House (Profile Books, 2010), Ordinary Lives: Studies in Everyday Life (Routledge, 2010), and an account of ‘New Brutalism’ in British art in the 1950s. Recent books include A Passion for Cultural Studies (Palgrave Macmillan, 2009), The Design Culture Reader (Routledge, 2008), and Michel de Certeau: Analysing Culture (Continuum, 2006).